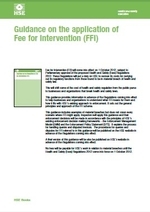 HSE Fee Intervention Guide will show on screen for download and we will email you a copy. HSE proposes to introduce a fee for intervention cost recovery scheme with effect from 1 October 2012, subject to Parliamentary approval of the proposed Health and Safety (Fees) Regulations 2012. These Regulations will put a duty on HSE to recover its costs for carrying out its regulatory functions from those found to be in material breach of health and safety law.